Whether you're taking a vacation, celebrating a special family occasion or just having some everyday fun, the slim and sleek PowerShot SX620 HS camera is ready for your next shot. Enjoy the versatility of a powerful 25x (25-625mm) Optical Zoom for subjects both near and far. Equipped with Intelligent IS for optimized image stabilization, it helps capture everything from lovely close-ups to distant sights virtually shake-free, with confidence. You can then show off your photos with built-in Wi-FiÂ® and NFC, which lets you transfer them to your compatible devices and upload to select social networking sites for your family, friends and the world to see. Stunning image quality comes via a 20.2 Megapixel CMOS sensor and the DIGIC 4+ Image Processor for beautiful shots whether you're picnicking during the day or camping at night. If videos are more your thing, rest assured they'll have gorgeous detail with 1080p Full HD video at your fingertips. With the PowerShot SX620 HS camera, you can relax knowing you can capture subjects far off in the distance. With the PowerShot SX620 HS camera in hand, youâ€™ll be impressed at the zooming capabilities of this slim, compact digital camera. The amazing 25x Optical Zoom lens packs high zoom power into a slim design to get you down on the field, high atop a skyscraper, deep into a landscape and much more. The cameraâ€™s advanced technology helps ensure that images and videos are captured in outstanding quality, with Intelligent IS that chooses the stabilization method that matches the shooting conditions, so images are virtually shake-free in a wide variety of situations. Built-in Wi-FiÂ® technology allows for on-the-go convenience when you want to share your photos and videos with friends and family. Easily post your images to select social networking and media sites â€“ FacebookÂ®, TwitterÂ®, YouTubeâ„¢, FlickrÂ®, and Google Driveâ„¢ â€“ through CANON iMAGE GATEWAYâ€ directly from your PowerShot SX620 HS camera, or save them to the online photo album to share anytime, anywhere. The camera can also connect directly to both compatible iOSÂ® and Androidâ„¢ devices*, and upload images via the Canon Camera Connect app* without a computer. You can control the destination of your uploads to share with everyone or to select groups, and even add comments. Sharing video is also easy with Wi-FiÂ® equipped PowerShot cameras, which record video using the easy-to-share MP4 format. Wi-FiÂ® capability makes posting in real time possible, so you can keep everyone up to date with photos and video even as events unfold. Wi-FiÂ® technology also allows you to transfer images to other Wi-FiÂ® equipped PowerShot cameras or print your photos directly to a PictBridge (Wireless LAN) certified printer. Thanks to the newly added Wi-Fi Button, you can now connect in both Shooting mode and Playback mode for quick and easy operation. You can even turn on the camera and connect at the same time with just one press of the button, helping you get right to sharing and managing your files when you like. PowerShot digital cameras with built-in NFC (Near Field Communication) technology provide fast connectivity with a single tap. Simply touch the NFC icon on your camera to your compatible Androidâ„¢ device, and the Camera Connect app will launch automatically for quick, easy sharing of your images. Built-in NFC technology also makes it simple to install the app. If the app hasn't been installed yet, once you touch the devices together for the first time, the download screen will display automatically. Simply touch the camera against an NFC-equipped device with the Canon Camera Connect app installed, and a Wi-FiÂ® connection is established â€“ no camera operations required. Even if your camera is off, NFC turns the camera on and establishes the connection (confirming the cameraâ€™s nickname and privacy settings before the first connection is required). With the built-in Wi-FiÂ® on the PowerShot SX620 HS camera, you can use your compatible smartphone or tablet to remotely control the camera. Simply connect wirelessly to your device and access the Canon Camera Connect app. Your device will show a live image of the camera's capture â€“ ideal for a commemorative group photo, wildlife shots and all kinds of situations. The cameraâ€™s versatile 25x Optical Zoom, flash, self-timer and shutter are all under your control, with images being saved to your camera as usual. The PowerShot SX620 HS camera employs a 20.2 Megapixel High-Sensitivity CMOS sensor, which delivers powerful imaging performance and is optimized for use in compact cameras. Utilizing a sophisticated light-capturing design, it provides high sensitivity for high ISO capture with reduced noise. It's also incredibly fast, capable of rapidly capturing and moving image data to the processor, as well as enabling fast continuous shooting and fast autofocus. 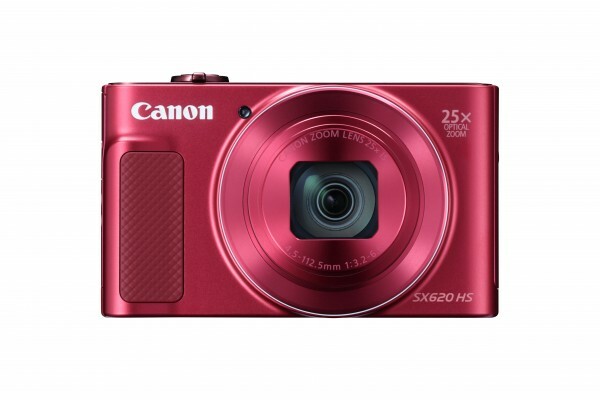 The Canon DIGIC 4+ Image Processor powers the PowerShot SX620 HS cameraâ€™s advanced functions and capabilities. Its accelerated processing speed creates fast, responsive performance, for a shooting experience that can be smooth and natural. The DIGIC 4+ Image Processor also helps enhance image quality by shortening the processing of high ISO shots by almost 60% compared to the DIGIC 4 Image Processor. This helps reduce noise for brilliant color, smooth gradations and beautiful detail even in low light. Hybrid Auto records up to four seconds of video every time you shoot a still image, then automatically joins the clips and pictures into a video that captures the essence of special days: vacations, important occasions or any time youâ€™re shooting many shots in a day. In this mode, Hybrid Auto automatically recognizes the scene and optimizes camera settings for incredibly high image quality. The resulting 720p HD video is properly exposed, crisp and steady, so your â€œhighlight reelâ€ is stunningly beautiful. Smart AUTO intelligently selects the proper settings for the camera based on predefined shooting situations to help you create the best possible image. Smart AUTO is a sophisticated Canon technology that makes getting that great shot as simple as pressing the shutter button. It automatically detects scenes by assessing various factors in both the background and the subject. Detected scenes are analyzed using predefined shooting situations. The camera then makes optimal settings to help facilitate incredible image capture, whether youâ€™re shooting stills or video. With Smart AUTO, all you have to do is frame your shot and capture away. PowerShot cameras offer shooting modes that make it easy to take impressive photos in a wide range of shooting situations by providing intelligent presets with optimized settings.